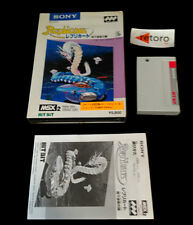 Sunrise played a key role in the MSX Community in the early and late 90's. Apart from releasing hardware and software from various groups they also published three disk magazines: Sunrise Magazine, Sunrise Picturedisk and Sunrise Special. As a christmas gift, these disk magazines are now available for download in the MSX Resource Center downloads database. A week ago we already added the Clubguide Magazines, Picturedisks and Specials created by Genic. Sunrise is the continuation of this dutch MSX Group. At the moment, Sunrise does not release disk magazines anymore, but they are still very active. In January they will release Bombaman (created by Team Bomba) and yesterday they announced they are working on an MSX Game Reader. Furthermore they have released many software titles and interesting hardware (like the Moonsound, Graphics 9000, IDE-interfaces and the CompactFlash interface). For more information on Sunrise: surf to their website. The Sunrise Picturedisks brought the latest demo's of the MSX Community all bundled on one disks. Amateur groups used the picturedisk to announce their upcoming products, or just to show their skills. Every Picturedisk had a different menu, in the form of a little game. Sunrise Special magazines contained in-depth information on the MSX hardware and how to code it in C, Pascal or Assembly. 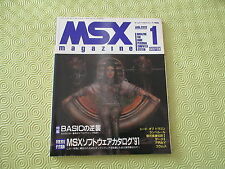 Therefor, these special magazines aimed at an audience of advanced MSX users. One small sidenote: most of the contents of the Magazines and Specials are in Dutch, the Picture Disks are mainly English. Happy downloading! Sunrise doensot played but stil plays !!! Well... Since the community is no longer held together by Sunrise Magazine's and BBS's, but rather the internet (and more specifically mailinglists, IRC and sites like MRC), I think Sunrise' key role nomenclature is currently doubtful. Looking at the Sunrise homepage, I see a horribly out-of-date site, with many information lacking. It all seems very 1996 to me. Ofcourse Sunrise still plays a relatively large role in the MSX community (mostly as a hardware supplier), but the glory days of Sunrise in which it forfilled a leading role are over. Sunrise has not moved on with the times and is in danger of becoming archaic. What a stupid nonsense ! hehe, this is gonna be fun again. Would you like to explain WHY you think it is "stupid nonsense"? Well it is the last I say about it because I have better things to do. Fact is that we bring 2 new games as you should know and had to keep the promise as regards the Moonsound music for TLW. That new games not have been made is not only in our hands , but also a fact of people who want to program or not. Fact is that Sunrise has found its place in Japan also using their own strength , resulting that 25% of CF-interfaces went to Japan and by building up good contacts as well. We together with Ese factories already have 3 hardware pieces brought to Europe . The ESE-PLD, the Gamereader and the CF. If I read your comments I get everytime the feeling MRC is everything. For me is Revival : MRC, Sunrise, ASCII, ESE, MSX NBNO, Team Bomba, MSX-Info, Padial etc. Due to our contacts also in Spain with Hnostar it is still possible to sell boxed version at a reasonable price. I said 'sites like MRC'. I definitely do not think MRC is everything, nor do I think Sunrise is nothing. MRC and Sunrise focus on different things, and IMO should work together more. The examples you give are for the most part hardware, which I said Sunrise does play a large role in. In fact, you seem to agree with most that I said. Maybe you should try to read and understand before calling something 'stupid nonsense'. It's simply a fact that Sunrise does not encourage MSX groups to create games the way it used to do it. Where are the new chapters to RoA? UMAX has always been very close to Sunrise, but apparently you (Sunrise) have not been able to motivate them to continue, despite the good sales of the first chapter. The recent troubles with developers declaring their products freeware, coming as a surprise to Sunrise, does not help the view of some people that Sunrise' software department needs an overhoal. It's also a fact that the Sunrise website is incomplete and most of it is permanently 'under construction'. As an example, the 'history' section is 100% purely Sunrise Swiss history. There's no mention of the dutch roots of Sunrise, etc... While this is not a functional part of the site, it is characteristic for the rest of it. I stand by my words... Please don't see it as a complaint or nagging, it's just some constructive criticism and perhaps a view of reality. Maybe you could actually work with it, in stead of sticking your head in the sand. I can read sorry for you ! As far as website and Hardware you are right. Website , well those guys in switzerland are not , unfortunately able to set the stuff on the page I worked hours on. We are aleady busy to setup a backup and new site for the dutch part, because I figured out, that the funclub probably will not exist after february . If there was nothing to improve , it would be sad, isn't it? But in the way you put it , Sunrise is redundant , although I have the feeling you make a little change in that point of view now. Although not so clear there is a download for free of Blue Warrior. The GFX9000 manual e.g. was already on our pag and you could buy it also by NBNO. Software you can not read two games in a row and as said up to programmers . Umax consists of 1 person at this very moment , how can you expect a continuation of something. Except from Team Bomba. I have only seen the offer from Vincent v.d Vliet overhere again, but they never contacted eachother. Recently , after I made a call in a forum Vincent reacted. If the group can be reunited, cause I ready did due to the call in the forum. So do not say , I donot have done that lay in my power- for you and many others maybe not enough- and still doing to get UMAX reunited, because that is your point and not if Sunrise plays a role. As regards the sellings of Realms , you donot have the slightest idea how bad. Under the 50 copies, of which 25 to spain ! About the magazines, guys this isnot correct there is 16A, 16B,17A AND 17B. 18 till 20 ,right ! But 16A ,16B , 17A 17B , for sure is not good. "I can read sorry for you !" "But in the way you put it , Sunrise is redundant"
Apparently you can't, because I never called Sunrise redundant. I'm glad to read you're finally working on improving the website. Also, I never said you didn't do ANYTHING to get Umax working again (afterall, they made a promise), I just said Sunrise (in general) doesn't motivate people as it used to do. Again, don't be so defensive. I'm only trying to help.